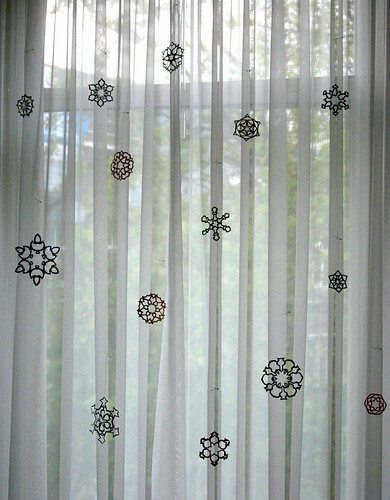 I love your snowflakes - your cutwork is amazing! These are so pretty - I remember making snowflakes with you last year for my dance class. However!!! I want to hear far more about your pregnancy!! How are you doing? And, more pictures!! I always *love* your snowflakes but never seem to be able to make them myself. The ones I have from years gone by are sadly tattered! Yes, must make some for myself as I've just moved into a new apartment. I've been thinking about you and D here - I just moved into a much smaller apartment than my last place in Montréal so I'm having to substantially reduce the amount of stuff I keep around. Clearly what I'm doing is not the same as what you did, but it reminds me of some of your posts from ~1 year ago. I love these! When you posted your "how to" I immediately tried to make one at my desk. It turned out ok, but not nearly as artful as yours! I really like this little "giveaway' idea. Have you ever thought about putting one snowflake in every card you send? It would make for a nice personal touche. I also have to agree with Angela #1, more about, and pics of Little Bun! They're so pretty! I would make some, but I don't think they would survive our cats and toddler. I made do with some stick-on ones for the windows. Your snowflakes are great, and I really appreciate you posting the tutorial, because I plan to make some this your for our Christmas tree. We have a new kitten you see, which means that none of my glass ornaments can go on the tree, and I'll have to fill in the gaps with non-breakables, including paper snowflakes!